Here's a surprise...teachers are human beings. That might not be a shocker to you, but to some students teachers are academics, authority figures, experts in their fields, and (sadly) unapproachable. To learn best from you, students need to see you as a person they can talk to, ask questions of, and trust. Personal connections can be made in subtle ways that don't sacrifice your role as leader and guide. In Environmental Science (BIOL120), we need to assess the impact of a growing population on the state of the world. The phrase "Population Control" is used in more than one textbook and is a concept that tends to cause controversy and even alienate some groups of students. 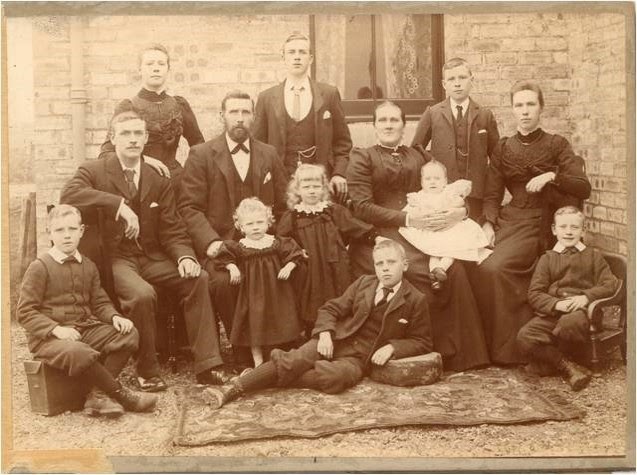 In an effort to be sure students understand that I am not "anti-reproduction" I show a picture of my great grandparents and their offspring in Scotland. Go ahead, count those children. My grandfather is the one in the front, looking smug. If my ancestors had stopped at 8 children I would not exist! This picture serves several purposes. It reminds the class that big families were the rule just 100 years ago. If you pair it with some math it illustrates exponential growth (and each child had 11 children and so on and so on). But most importantly it lightens the mood and shows that I have a history, and a personal stake in the material I'm teaching. We ask our students to seek relevant connections with the material and we shouldn't be afraid to do it ourselves. For more ideas or to share your ideas with us, visit us in the CTE or email Meg Elias at clarkm1@star.lcc.edu.